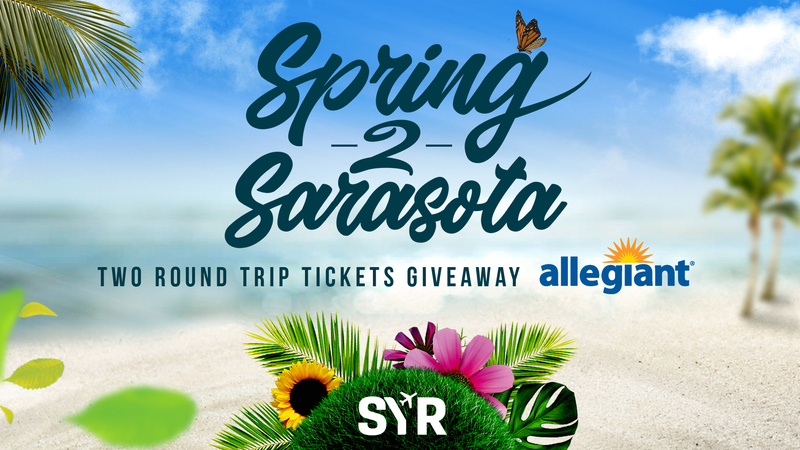 #Spring2Sarasota is a Syracuse Regional Airport Authority sponsored social media contest where people have the chance to win two round trip tickets* from Syracuse Hancock International Airport to Sarasota-Bradenton (SYR to SRQ). Enter to win by following @syracuseairport and @allegiant on Twitter and Instagram. Next, post a photo of your best, fun, creative (and tasteful!) Central New York-themed “beach” pose and a caption that explains why you deserve the trip. The contest will begin on April 1, 2019 and end when the winner is announced April 12, 2019. Be sure to use the hashtag #Spring2Sarasota in your caption! Follow @syracuseairport and @allegiant on both Twitter and Instagram and post a photo publicly on both social media platforms with a description of why you deserve the trip. The photo should be of your best, fun, creative (and tasteful!) Central New York-themed “beach” pose. It should include a caption that explains why you deserve the trip. Include #Spring2Sarasota in your description! You must be 21 years or older to win. You must be eligible to fly. The photo must be posted publicly and contain the hashtag #Spring2Sarasota. The photo must be your own.